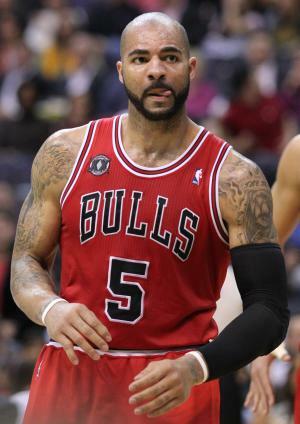 Carlos Boozer was born on the 20th November 1981, in Aschaffenburg, West Germany, and is an American professional basketball player, known for being an NBA power forward while playing for the Cleveland Cavaliers (2002-2004), Utah Jazz (2004-2010), Chicago Bulls (2010-2014), and Los Angeles Lakers (2014-2015). Boozer has also represented in the US national team which won a gold medal in the Beijing Olympics in 2008. Most of his income Boozer has earned by playing basketball. His career started in 2002. Have you ever wondered how rich Carlos Boozer is, as of mid-2016? According to authoritative sources, it has been estimated that Boozer’s net worth is over $45 million, being a successful professional basketball player whose most lucrative contract has been with the Utah Jazz when he signed a six-year $70 million deal in 2004. Carlos Austin Boozer Jr. was born at a military base in West Germany, but soon after the family moved to Juneau, Alaska, where Boozer went to Juneau-Douglas High School and took up playing basketball. His early success in high school was evident as Boozer was the leading player of the Juneau-Douglas Crimson Bears, and led them to consecutive state titles, and was a two-time member of the PARADE All-American high school basketball team. Some of the highest-rated basketball programs in the country showed interest in Carlos, but he opted to play for Coach Mike Krzyzewski at Duke University in 1999. Duke and Boozer won the NCAA championship in 2001, and in the same year hr was in the US team that won gold at the FIBA U-21 World Championship in Saitama. After finishing college, Boozer entered the 2002 NBA Draft and was selected by the Cleveland Cavaliers in round two, as the 35th overall pick. He got an average rookie contract with the Cavs but stayed there for only two seasons, averaging 10.0 points and 7.5 rebounds per game in his debut year, and 15.5 points and 11.4 rebounds in his sophomore season. Cleveland decided to release Boozer and made him a restricted free agent. The Utah Jazz stepped in and offered Carlos a staggering $70 million for six years, the contract that Cleveland couldn’t match, so Boozer moved to Salt Lake City. In the next six years, Boozer was the Jazz’ best player and one of the hottest power forwards in the league. He averaged a career-high 21.1 points in the 2007-08 season, and 11.7 rebounds in 2006-07. Carlos also appeared at the All-Star game twice, in 2007 and 2008, and was selected to the All-NBA Third Team in 2008. That year was the most successful in his career as he also won gold at the Olympics in Beijing. In summer of 2010, Boozer was acquired by the Chicago Bulls and spent the next four seasons in the Windy City, averaging 15.6 points and nine rebounds per game. He also helped Chicago appear in the playoffs in all four seasons, before he departed for the Los Angeles Lakers in 2014, but off amnesty waivers, so the Lakers paid only $3.25 million of his $16.8 million salaries, withthe Chicago Bulls paying the rest. He played a rather weak season in L.A., averaging 11.8 points, 6.8 rebounds in 23.8 minutes per game, but his net worth is steady. Boozer is a free-agent as of mid-2016, and will consider retirement if fails to find a new team at the beginning of the 2016-17 season. Regarding his personal life, Boozer was married to CeCe for six years, from 2003 to 2009, andthey have three children together. He has since admitted to an affair with the Bachelor contestant actress Michelle Money. However, Carlos Boozer is a Christian, having numerous religious tattoos on his body.